Kenny vs Spenny is Returning for a 6th Season! What do you get when you mix television’s most notorious frenemies, with off-the-wall competitions and an abundance of humiliation? The sixth season of Kenny vs. Spenny! Kenny vs. Spenny will return for an all-new sixth season this November exclusively on Showcase. The half-hour series created by and starring Kenny Hotz and Spencer Rice, began production this week on 13 new episodes. “This season I am going to do everything in my power to make Spenny quit. I don’t want him to but I’m scared I may actually kill him if we keep going!” said Kenny Hotz. “As always I will do everything in my power to defeat Kenny. That said, I only ask that fair-minded fans look at every competition this season and discern for themselves the difference between out-smarting an opponent and cheating. Thank you for your patronage, and if applicable, your love and support,” said Spencer Rice. 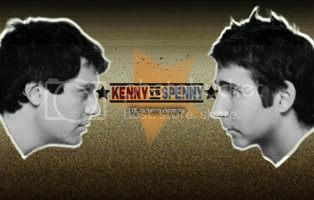 Kenny vs. Spenny is a hilarious reality series that pits childhood friends against each other in outrageous competitions. The winner achieves short-term glory and bragging rights, while the loser is forced to perform a humiliating stunt of the winner’s choosing.